Graeme Shinnie is out of contract at Aberdeen at the end of the season. 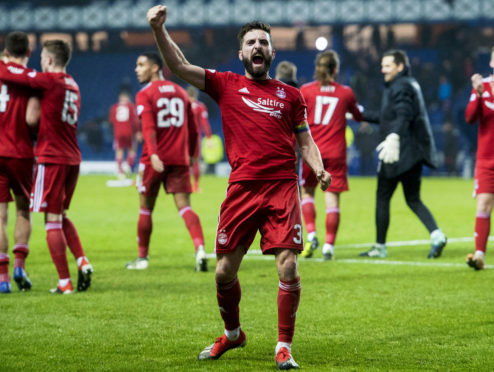 Former Aberdeen captain Paul Hartley says Scottish clubs simply cannot compete with the money on offer in English football as Dons skipper Graeme Shinnie mulls over the chance of a lucrative move to England. The Dons captain is in the final six months of his contract at Pittodrie and has been offered the chance to play in the Championship by Wigan Athletic while Hull City and Sunderland are also tracking the midfielder. Hartley knows Shinnie has strong ties to the Granite City but is aware of the lucrative proposition English football would present for the midfielder. He said: “It is a big decision for players who are 27 or 28 and coming to the end of their contract. Many see this is their last chance to make a big move and they have their families and financial security to consider as well as the chance to try something different. “Maybe Shinnie wants the chance to try something different. If he was to go it would be a big loss for Aberdeen as he has been brilliant for them. “I see the support he gets from the fans and his manager, everybody loves him at Pittodrie. McInnes has not given up hope of keeping Shinnie at the club but Hartley, who had two spells in England with Millwall in 1996 and Bristol City in 2009, understands why Shinnie will be tempted. He said: “Players are attracted by England for lots of different reasons. “It’s a different environment for a start. The Championship offers a completely different style of football and financially it’s a big move for a player. You get the chance to play in a big league for and against some big clubs. “People have got to look at it financially. There is a lot of money in England in the Premier League, the Championship and in the top half of League One. The Championship is the second tier of English football but it is one of the richest leagues in the world. “It’s natural a player would be attracted by that. It’s a new challenge and a change from the four times a season structure of the leagues in Scotland. “Scotland has become a good market for English clubs and you just need to look at the number of players plying their trade down there and doing well to see that. “There are a lot of big clubs outside the Premier League and Scottish football offers them value for money. We’ve always looked at English football clubs as stealing our players and maybe they have but our league is getting better all the time, the publicity is increasing, and the profile is good.